I’m a little over obsessed with CHANEL. Besides their makeup, I really love the simplicity of the CHANEL logo and their black and white branding. 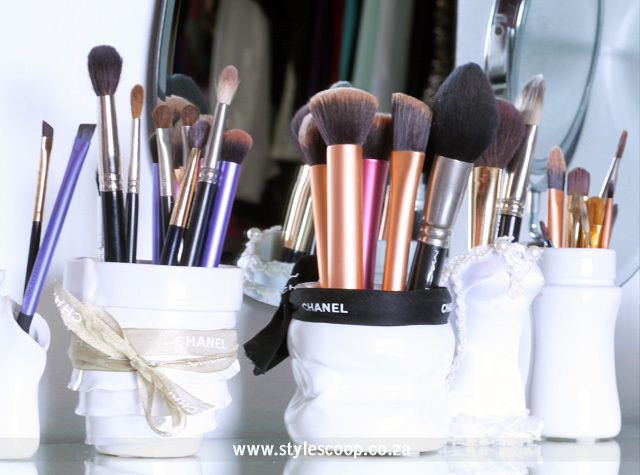 So, this weekend I decided to do a little DIY and add some CHANEL touches to my vanity! I’ve been collecting designer shopping bags for quite some time. My intention is to frame them and create a massive display over my desk in my office. But, since every bag is a different size, my budget has forced me to wait a bit – since I would have to have these custom made. In the meantime, I had some frames left over my “wall of frames” project that I did in my hallway and they were the perfect size to frame my CHANEL shopping bags. All I needed to do was spray paint them! 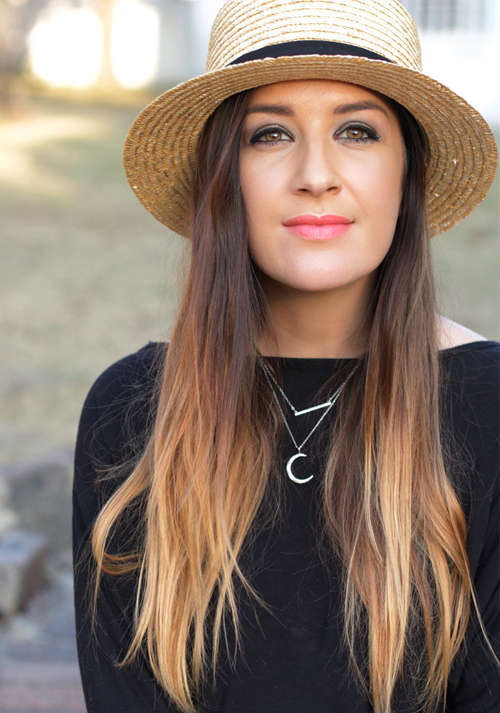 I used a total of 6 frames – all purchased from Mr Price Home. Two large, two medium and two small. 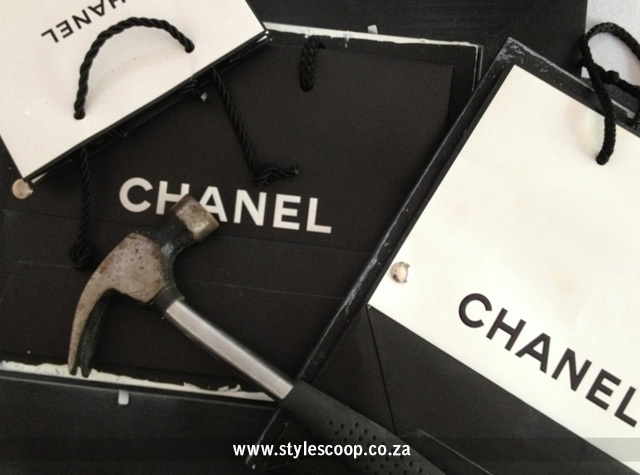 I had a variety of CHANEL bags in black and white and since I wanted to create an “effect” rather than a massive CHANEL shrine, I painted one frame in each size in either black or white. This gave me a total of one large, one medium and one small sized frame in black and one of each in white. I used the medium sized frame to frame two shopping bags. I then placed the medium frame inside the bigger frame to create a mounted border effect, and they fitted perfectly. 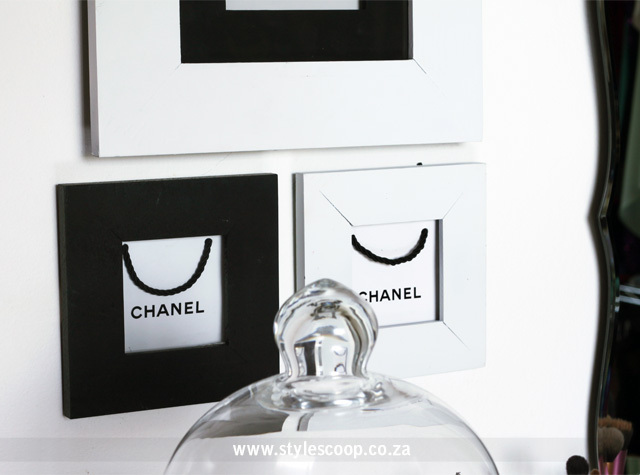 The mini CHANEL shopping bags, were framed in a single frame and I used the smaller frames for these. I used drawing pins to stick the shopping bags onto the wooden frame and then put a big piece of magnetized board at the back to finish it off. I used a magnetized board becuase it is much stronger than cardboard and it is what I had in my garage. 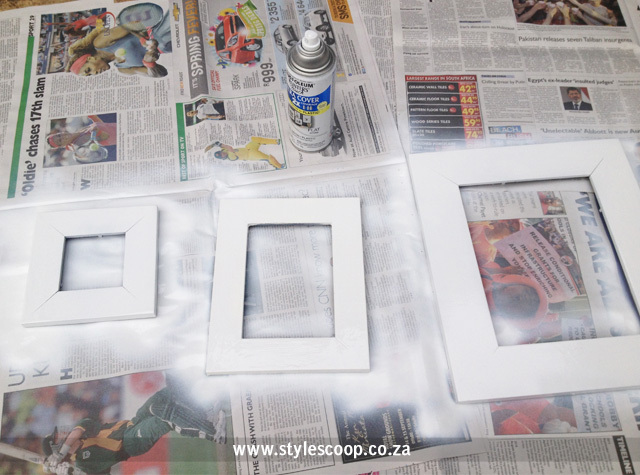 Creating these frames was very quick and easy and did’t cost much. I hung up these four frames in my closet room, above my vanity. Now, I know I’ve said this a bazillion times, but I really need to do an updated post on my closet room and makeup setup. My entire vanity has changed, and while I’d love to show you guys, I still need to get around to painting my dresser. At the moment it’s still an oogly standard pine wood colour, but I have plans to paint it white – or perhaps even black, now that I have some black touches in my “decor”. The only eye sore is the first frame. I kinda hammered it too hard (when putting on the picture hook) and it cracked my white frame inside. At some stage, I’ll get around to re-doing it. I’ve also added another little touch of CHANEL to my dresser, by tying a cute CHANEL ribbon to my makeup brush containers.